I have a great giveaway for you all! This is a great way to jump start your holiday shopping or to wrap it up if you’re ahead of the game this year! This week I have a $75 gift card from Sears for you! If you remember earlier this month I was one of the featured bloggers on the Sears website, well for doing that they gave me the gift card to giveaway to one of my lucky readers to use in the store or online! 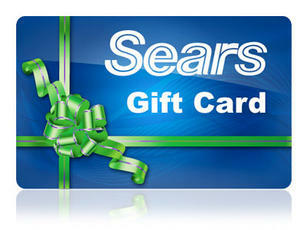 Tell me what you’d like to use the Sears gift card for. Like With Just a Bit of Magic on Facebook. My friend and fairie blogmother, Jill from Single Mom on a Budget was also one of the great bloggers featured on the Sears site! Go check out her site for a more entries to win! The giveaway end Novemeber 7th at midnight EST and the winner will be chosen by random.org and notified on Monday, November 8th.